Marsala is a coastal town in western Sicily, the biggest island of Italy. It’s globally known for its fortified wine called Marsala, ancient ruins, and Stagnone Nature Reserve. As one of the wine bloggers to address Jill Barth’s invite, Island Wines Of Italy: How Many Do You Know (#ItalianFWT), I’ll focus on the “wine” part of what Marsala is known for, leaving the famous Sicily cruises and convenient Eurail rides up to the readers. Marsala wine is made from Grillo, Catarratto and/or Inzolia grapes, white grapes natively grown in the inland near Marsala and Mazara del Vallo in the Sicily Island. 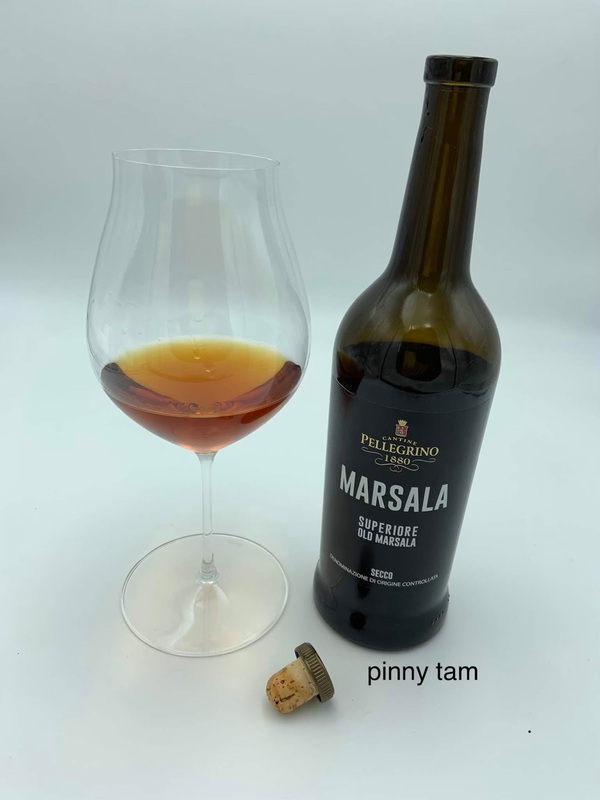 Marsala wine is typically of amber-color, has the iconic iodine smell, and is generally semi-sweet (even it says dry) to sweet on the palate in the modern-day styles. Farmers in the western Sicily made this wine as a locally consumed alcoholic drink back in the 18th century (or before) until multiple English adventurers ventured to Marsala, tasted and liked this beverage, and saw the opportunity to export this wine from Marsala to England. As attractive as the Portuguese Port and Madeira in color and taste, these few Englishmen introduced Sicilian marsala wine to mainland Europe and Far East. Cantine Pellegrino, the famed wine maker of Sicily since 1880, continues to produce top-notched and variant marsala wines to the current day. The introduction and continual production / consumption of marsala wines loosely aligns the modern new product (wine) life cycle – an ideal case study in oenology! 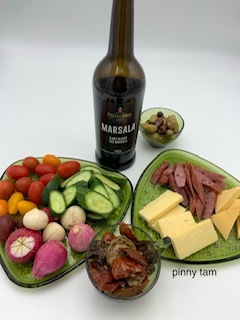 · DESIGN: The history of Marsala begins with John Woodhouse, an English merchant from Liverpool who arrived in Sicily in 1773 to look for food products such as almonds, honey, oil and tuna salami. A storm forced his ship to detour and to find shelter in the port of Marsala, where he found a delightful, locally produced peasant refreshment in a tavern, and was impressed by how good the high alcohol-content wine and rich flavor were. Due to marsala wine’s similarity to the already popular Port and Madeira, Woodhouse wanted to bring this wine back to England, and smartly added wine spirit to the wine to stabilize it during the long sea voyage. The first load of Marsala wine arrived in England…intact! · MANUFACTURING: Benjamin Ingham is the second Englishman that marks the history of Marsala wine. He arrived in Sicily in 1806, trying to establish new outlets for his brothers' fabric factory in Leeds. He settled in Palermo, around 50 miles northeast from Marsala, with the original intent of importing wool from England and exporting natural products from the island. Seeing the potential of large-scale wine trade in Marsala, he began to build a large, modern, technically equipped oenological plant in Marsala to mass-produce and standardize the quality of marsala wine, exporting the wine beyond the English market to other foreign countries. · DISTRIBUTING: The history of the pioneers of marsala wine continues after Benjamin Ingham. With the growth and expansion of his businesses and enterprises, the merchant called upon two of his nephews from England, including Joseph Whitaker, who dedicated himself to the production of marsala wine by joining his uncle in the family estate, and contributing to the creation of a fleet of sailing ships, which carried marsala wine to reach North America and the Far East. · CUSTOMERS: Horatio Nelson, a British admiral at the turn of the 18th and 19th centuries, is one of the most beloved and famous national heroes of England. As he became a great lover of the wine, he created a widespread drinking trend of marsala wine in European salons, and distributed it to the crews of his fleet, becoming what we see as a modern-day “wine influencer”! · END-OF-LIFE? - STILL GOING STRONG: Cantine Pellegrino, the famed wine maker of Sicily since 1880, continues to produce variant marsala wines products, ranging from high-end to entry-level sweet or dry marsala wines that deserve to be drunk on its own as well as cooking. "Cantine Pellegrino dry Marsala Superiore is a fortified wine made from white grape, Grillo grown in Marsala, Sicily. With deep amber color that mimics maple syrup, this dry Marsala has roasted almond and a hint of orange peel on the nose. The taste of caramel, molasses as well as warm spices wiggles through as you take slow but continuous sips. The dry style of this wine tames the iodine notes (notes you may sometimes find in Port and Madeira) that are present at the initial sips, subsequently showcasing dried figs and creaminess - the full potential of this food-friendly wine to pair savory dishes! Recommended pairings: 🦑squid ink pasta with Parmesan cheese, cold antipasto platter." Far from being bone dry, the dried-fig and stewed-fruit flavors of this dry Marsala pairs well with strong and rich cheeses like what we have here, the Irish Kerrygold Vintage (aged two years) Cheddar and Dutch double-creamy Gouda. I also picked up the assorted olives and oil-infused mushroom/artichoke/eggplant bites from Trader Joe’s and cut up some vegetable to complete the cold antipasto theme. The dry style no doubt complements the salty, oily, savory bites. To showcase the versatility of this wine, I eventually cracked open all the food products I bought from Italy in August last year, and cooked squid-ink Rotini pasta in Nero Di Seppia Sterilizzato (squid ink paste), finishing with a drizzle of white truffle oil and some Parmigiano-Reggiano cheese. 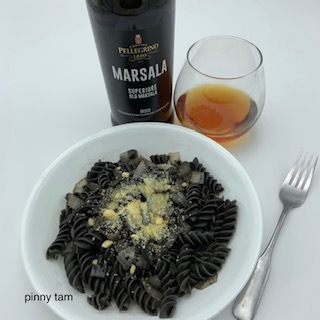 I have to say the pairing of this pasta and the Marsala wine is by far my favorite pairing as the texture of the wine is rich with nutty and semi-sweet flavors that go extremely well with brininess of the squid ink and intensely aromatic and tasty white truffle oil. OK, time to go back to Chicken Marsala! 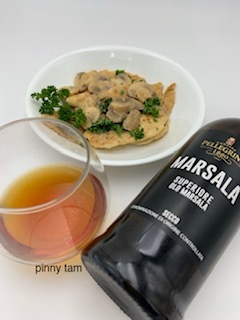 Thinking of truly tasting this dry Marsala in the chicken, in additional to adding ¾ cup of the wine, I decided only to garnish the finished dish with Italian parsley. Chicken Marsala is made by first pan-frying thinly sliced flour-coated chicken thighs or breasts, adding dry or fresh herbs of your choice, and then simmering the cooked chicken in a reduced sauce - Marsala wine, half-and-half cream and chicken stock. I have to say I enjoyed the chicken very much as the sauce was tightly encapsulating the flavors of the wine. However, to let this wine shine, I’d still prefer drinking it. Well, it's time for me to drink up the leftover Marsala that’s in the fridge! 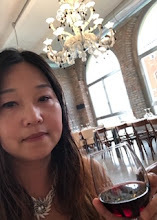 Please join me and the following writers as we share the process of writing our stories, rich with details about the food, wine and trips that inspired us. What great background on Marsala - I feel like I've just attended a class on it! 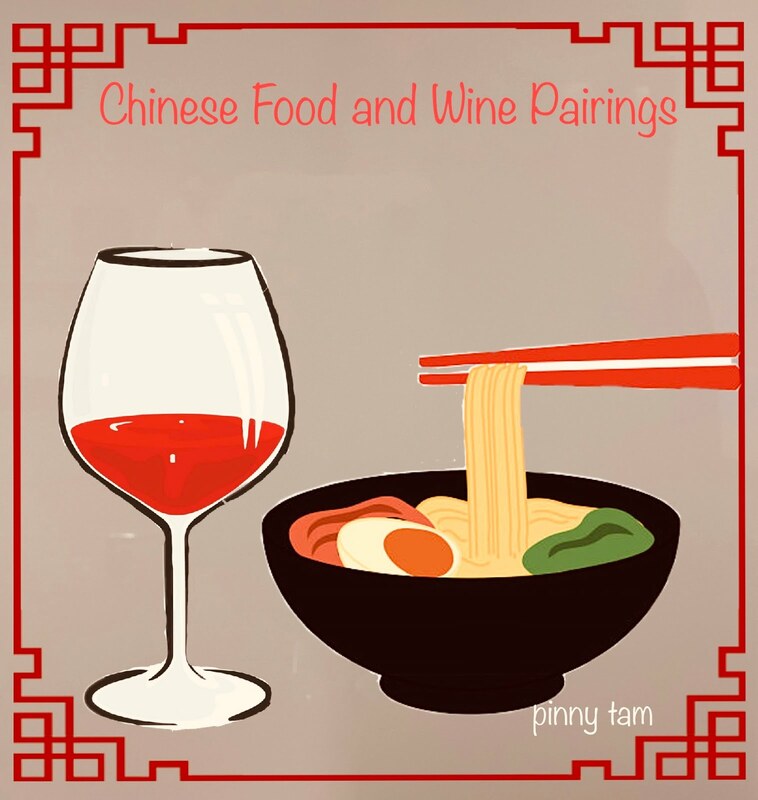 And your food pairings look absolutely delicious! Cheers, Pinny! Thank you Lauren. I really like the story of Marsala wine - just like many other Old World wines...how it was discovered by the other European explorers, then exported to other countries, becoming world famous! I frequently cook with Marsala, but you have opened my eyes to further exploration. Thanks for sharing! A great recap on the history of Marsala. It's too bad many people still associate it with lower quality cooking wine- they are missing out. I particularly like your squid-ink pasta pairing and am definitely going to try that one! Thanks Lynn. Yes the squid ink pasta does pair the best with the wine! I am definitely rethinking Marsala based on this post and the one that Cindy wrote today, too. Cheers. Glad you’ll give Marsala wine a second chance! I have never used Marsala for sipping only for cooking. I think it may be perfect though with ripe cheese and figs after dinner. Thanks for the idea. Wendy, ripe cheese and figs are perfect. Thanks for reading! Love this history of Marsala. Thanks for sharing it with it us, and definitely going to have to try it with some squid ink pasta. Yum! I love the history too...the distribution of the wine to other European cities was typical. But what was so fascinating was that the Englishmen got so involved in the production of the wine. Thanks for reading! Great history on Marsala. I have made Chicken Marsala for years, a favorite of my daughters, but time to try it with some other food pairings, thanks for the ideas! Glad you are going to explore other food pairings! Oh my Pinny! You've outdone yourself. I don't think I've ever had Marsala that wasn't in a sauce. I'v been meaning to try it, but haven't gotten around to it yet. Thanks for the introduction and overview. Your pairings look great (especially the squid ink dish...I love em!). I'm a big Sherry and Madeira fan, so I think I'd enjoy Marsala too! Don't mean to compete with anyone:-). The squid ink pasta was in fact very good-an inspiring dish from my trip to Venice last year. I recently turn into a fan of Sherry and will keep trying more Marsala and Sherry when I see them!